Elena will be eighteen in two months. She’s about to age out of the system and will be forced to leave her foster parents’ house. With no job, and the prospects looking rather bleak, it’s not surprising that when the Aether Corporation approaches her to help with an experiment, she’s all in. Added to that is the fact that they’re going to be paying her more money than one person needs in a lifetime and the minor hesitations she feels just go away. Turns out, the Aether Corporation will be sending Elena and four others ten years into the future. All they have to do is record what the world looks like and bring back any technologies they can for study. Seems pretty easy right? Well, red flags are flying when the group ends up 30 years into the future instead. Okay, maybe it’s a slight error with the equipment. But when it comes to light that most of the group is killed a day after returning from the mission, everything else is abandoned in order to find out what the trigger is in the future that dooms them in the past. There’s this lovely little nod to Blade Runner (the movie and not the book it’s based upon). I was super giddy when this somewhat subtle thing was introduced because if you are familiar with the movie at all, there is so much conjecture that surrounds it and its imagery, the possibilities are endless. So, naturally, I was expecting this same thing from Future Shock. Unfortunately, on this front it’s more superficial. I wish Elizabeth Briggs would have utilized some of the more prevalent theories to add a bit of a punch to the story because, for the most part, I figured out where things were going before the characters did. I liked what was done with the setting though. Elena and the others go far enough into the future where things are definitely being done differently, but not so far that it seems out of reach. Meaning, the events in the story could very well come to pass in the real world, which I think makes for a more ominous read that fits with the mystery of looking into the future often presents. I’ll say I wasn’t too impressed with the instant attraction between Elena and fellow recruit Adam. The majority of events take place within a 24-hour period and already within that time, Elena speaks, to paraphrase, of how she can’t imagine going on without Adam, etc, etc. I would rather see the acknowledgement of attraction, but not get so deep with it so quickly. I think there is a better job done with the fast friendships that the five recruits develop due to the position they find themselves in. These five strangers come to rely on one another, regardless of any hang-ups or motivational suspicions, in order to ensure their survival. I loved the group interactions, and the varying skills each person brings to the table to help said group, more than I did the individual. 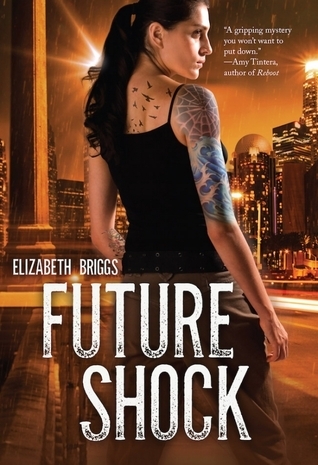 Overall, Future Shock was an enjoyable read. Because of the ticking clock time frame I read this one extremely quick. Even though I was less than surprised by many of the revelations, I still liked seeing how all the pieces fit together in the end.